Bhuvneshwar bowls the final over. Jonker can only collect a single off the first ball, smacking it towards sweeper cover. Behardien uppercuts a short, wide ball over short third man for a four. Single collected off the third ball, with an under-pressure Bhuvneshwar conceding a wide off the fourth. Jonker squeezes a full toss down the ground for a couple of runs. Two off the fifth delivery, with Jonker squeezing a full delivery towards square-leg for a double. 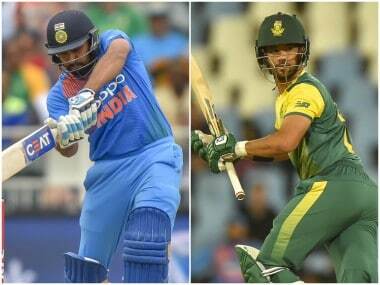 Full toss off the last ball, with Jonker getting a leading edge to get caught by Rohit at extra cover. India win by 7 runs to win the three-T20I series 2-1. That's two trophies to India out of three in this tour. Behardien pulls the ball towards the leg side for a double, with keeper Dhoni trying to slap the ball onto the striker's stumps in vain. ide off the next, with Behardien setting off for a single off the second legal delivery. That is before Duminy finishes things off in style with two mighty hits — the second one disappearing high into the stands over long-on to bring the 2nd T20I to an end! South Africa win by six wickets, as the series heads to a decider at Cape Town! Phehlukwayo gets a thick outside edge that carries the ball all the way to the third man fence at the start of the final over. He guidesthe ball towards deep midwicket for a double two balls later. Phehlukwayo perishes off the fourth ball, getting a leading edge off a slower ball that he lobs over to Chahal at backward point. Shamsi walks out to bat, and misses the last two deliveries. India pull off a 28-run victory to go 1-0 up in the series. The 33rd over, bowled by Tahir, lasts just one delivery, as Kohli smacks the ball down the ground to complete a remarkable 5-1 series victory for the 'Men in Blue'! 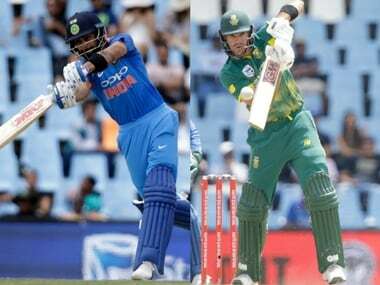 Keep in mind the fact that this is India's first-ever series win on South African soil, and few would have imagined them dominating the proceedings in such a lop-sided manner! Morkel pats the ball straight into the hands of Chahal off the first ball, with the latter putting the chance down. 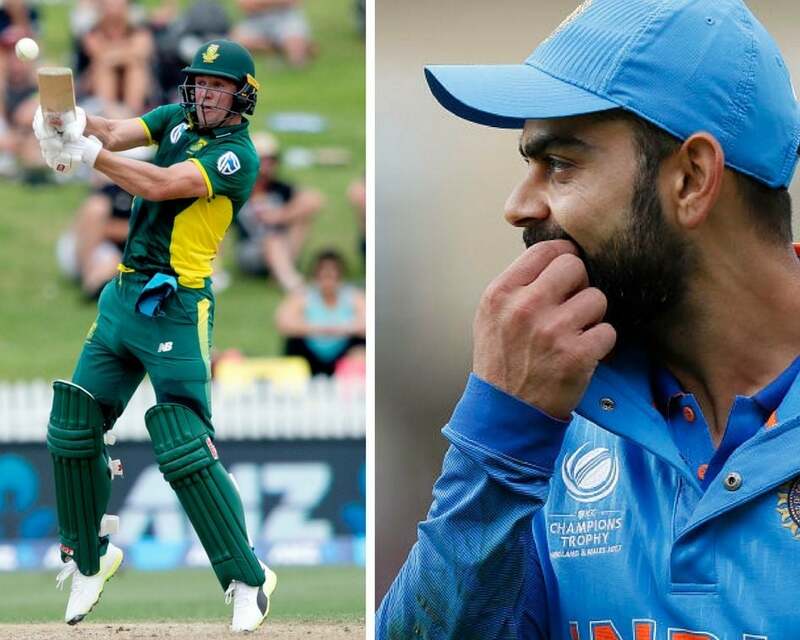 The leg-spinner however, doesn't have to wait long for the final wicket of the innings, as the lanky batsmen gets trapped leg-before the very next delivery, for the South African innings to come to an end. Was a complete collapse of sorts for the Proteas towards the end, as they lose their last four wickets for just five runs! 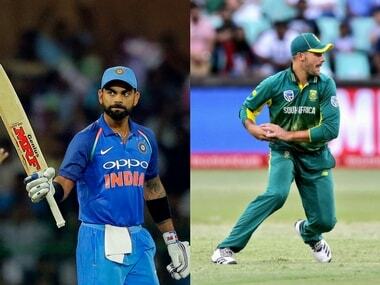 India, meanwhile, have clinched the series 4-1 with a 73-run win at Port Elizabeth — their first-ever win at the venue! And with that, they have sealed the No 1 spot in the ICC ODI rankings! 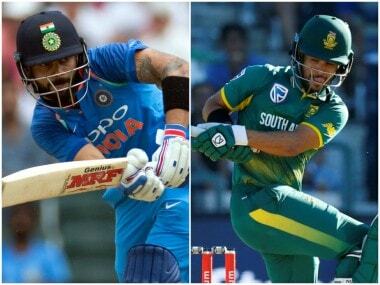 Catch all the live action of the crucial ICC Champions Trophy 2017 game between defending champions India and South Africa at the Oval Stadium.